Add this unit on for extra storage space at school, or use it on its own at home! 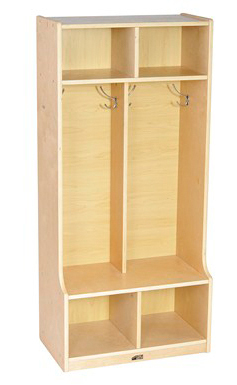 Two section coat locker can accommodate belongings for up to four children, with four coat hooks and two cubbies above and below. Bins sold separately. WARNING: Children climbing on furniture can lead to death or serious injury due to tipping. Secure unit to wall using appropriate hardware. 48" x 22" x 13"
50" x 15" x 6"
This product is shipped from our warehouse in Logan Township, NJ, USA.